Michael and Susan Wivell are the owners of BELVOIR! Derby based in Alvaston and serving the needs of the city of Derby and it's surrounds. Dedicated to Residential Letting and Property Management, along with a very successful Buy to Let Investment service, we are a professional and experienced business whose sole purpose is to manage your property. With a wealth of local knowledge, we are ideally suited for all your property rental, relocation and investment requirements. The Belvoir Lettings office in Derby has property letting information for apartments and houses throughout Derby and its surrounding areas. Please access our property facility to view the properties currently available for rent. Alternatively you can contact our Lettings team either by email derby@belvoirlettings.com or by telephone 01332 757571. We will be happy to advise you on the most suitable rental properties or Derbyshire locations. 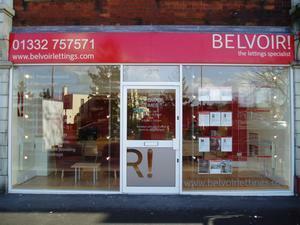 If you have a property you would like to Let, please contact Belvoir Derby via by email or telephone. Fay Dodd - Tenant and Property Services since 2006.